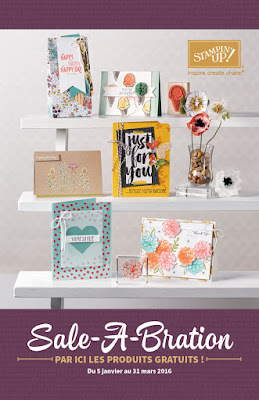 And a Sale-A-Bration catalog to take home with them. Guests entered for a door prize drawing of three prizes. The winners are each listed below the prize. 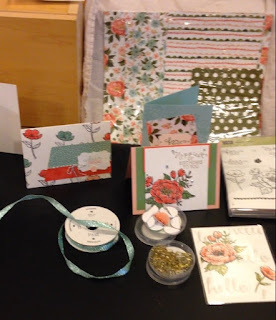 Door Prize #1 is a case of cards and goes to Janeen L.
Door Prize #2 is a variety of ribbon and twine for Patti F.
Door Prize #3 is a Paper Pumpkin kit and goes to Sandi D.
Guests tried out various tools like the Big Shot and thinlits. A display of the Blossom Birthday suite of products. New products were displayed with samples of designs for cards and packaging. 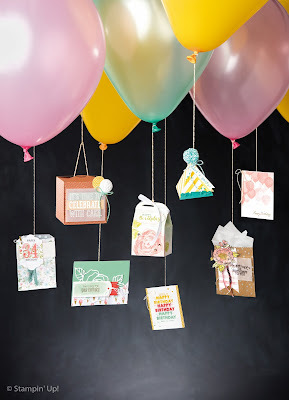 The Confetti Embossing Folder and sponge daubers make a very festive birthday card. This is a display of designs and products from the Annual Catalog. What are your favorite new products? Which do you plan to get right away and what SAB items will you pick?